For decades, Donald Benally has strived to be in a high-ranking official for the Navajo Nation. 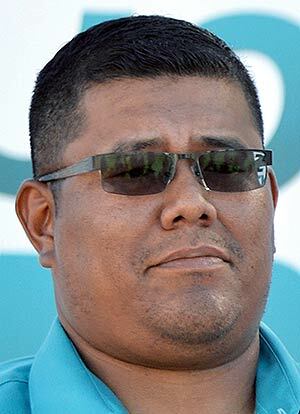 After two attempts to become the tribe's president, Benally is sitting out this general election while his son, Dineh, carries the mantle as a vice-presidential candidate on the Joe Shirley Jr. ticket. The son of Donald and Joann C. Benally, Dineh Benally said his life course was not set by his father but by a man who he believes was named Tsosie who came to his ninth grade class and talked about the work done by engineers. The man was there representing BHP and Benally remembers soaking in the information about the role engineers played in making life better for people by developing roads, water and sewer lines and other types of infrastructure that he realized were sorely needed on the reservation. So after graduating from Shiprock High School and then attending New Mexico Military Institute in Roswell, N.M., for two years, he had no problem selecting civil engineering when he went to New Mexico State University in Las Cruces. He said he toyed with the idea briefly of going to West Point when he was a student at the military academy. Although he received the nominations to go, he backed off because he was needed by his mother who was a single parent raising two children. While he was a good student in high school and at the military institute, he also had a passion for sports, playing football, baseball and basketball (his senior year) for the Chieftains. He made all-district in football and baseball. When he was at Shiprock all the schools in the district had good teams so coming in third in district still ranked Shiprock as one of the 10 best teams in the state. "In my senior year, we beat Bloomfield in football," Benally remembers. 'We hadn't beat them for something like 14 years. That was a great experience." While going to NMSU, Benally began getting involved in Native American issues, becoming president of the Native American organization as well as the American Indian Science and Engineering Society. It was during that time that NMSU officials tried to take away the funding from the Native American organization, claiming it was a club. But Benally and others fought back, arguing that it wasn't a club but a Native organization. Eventually school officials backed down. After he graduated from NMSU, he started using the skills he learned, first at the Navajo Generating Station in Page, Ariz., and then with Intel, a Fortune 500 company. At NGS, he worked as a structural engineer helping in wastewater treatment. At the Intel plant at Rio Rancho, N.M., he got an opportunity to use more of what he learned in college in a job that had him often commuting between New Mexico and Oregon. But after four years there, he said he became tired of listening to speeches and writing reports all day and decided he wanted to get back to that dream he had as a high school student -- using his engineering skills to help improve the quality of life for his people back home. So he signed up with the BIA and began a nine-year career working on building roads, schools and various kinds of infrastructure on the reservation. Along the way, he decided to dabble in state politics, running against John Pinto in 2003 for state senate. He didn't win but he was pleased that he managed to come closer to winning than most competition that Pinto faced over the years. In 2004, he got married to Joyce Arviso who is from the Red Valley, Ariz., area and they now have three children ranging in age from two to eight years old. It was about this time that he looked at becoming a businessman and started working to develop a RV park in the Shiprock area. The park ended up in lawsuits involving the BIA and others. The litigation is still ongoing and Benally said because of that he couldn't go into detail about what went wrong with the project. He has also made a commitment to continue helping young people and is involved in the area's 4-H organization and in youth baseball. He said he has now resigned from the BIA and plans to spend all of his time campaigning with Shirley all over the reservation.